Valve Software’s The Orange Box is on sale for $9.99 all weekend, meaning you have approximately fifteen hours left to do what you should have done when it was $50. This purchase gets you Half Life 2, Half Life 2: Episode 1, Half Life 2: Episode 2, multiple-game-of-the-year-winning-and-critical-darling Portal, plus the relentlessly jolly Team Fortress 2. Remember if you already own any or all of these, you can gift them to fellow Steam subscribers at no cost. There is no longer any excuse at all to miss out on the Half Life 2 cycle, with its rich political themes, excellent characters, and top notch level design; no excuse at all to miss the liquid hot joy that is Portal, no excuse not to ignite all your friends as a pyro in TF2. Come on, people, Valve Software needs the money is here to help! Man, you gotta stop bargain shopping tawdry rest stop experiences. Go for the $20 version at very least! Thanks for the heads up. Seeing as I had already purchased all the full meal deal of Half Lifes (Lives??? 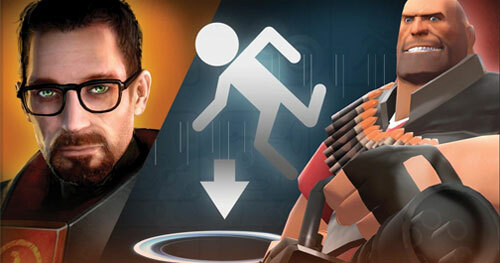 ), and had no interest in Team Fortress , I was mostly annoyed at Orange Box. It always seemed like Valve was vaguely taunting me for being the kind of sap who buys great video games they day they come out. So I decided to show them and not buy Portal. Now you go and ruin my fun with this…. Now that I own 2 versions of everything HL at least I can give away one copy each. Anyone who wants a free HL2 or HL2.2 let me know. At least I’ll have the satisfaction of…oh never mind. I went ahead and made the purchase last night. I had almost forgotten until I stopped by here. I have Half-Life 2 and Episode One, but the rest are all new to me, so I feel like I’ve made out like a bandit. Now, all I have to do is, you know, actually start playing something that isn’t “Left4Dead” one in a while.